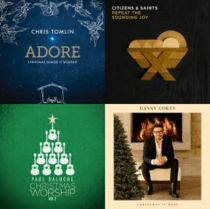 Are you looking for new songs to lead this Christmas? I know I always feel some trepidation approaching the holidays – expectations are high, & everyone seems to have an opinion. It often makes me cringe at the impending “celebration”, and that’s NOT right… but it’s true. Lastly, there’s such a flood of new songs hitting the market each year that it’s easier to just give up & return to those “same ole, same ole”, instead of seeking out a NEW “classic”.